A food waste "supermarket", which organisers say is the first in the UK, has been opened in Leeds. The Real Junk Food Project's warehouse on the Grangefield Industrial Estate in Pudsey is stocked with surplus food from supermarkets and local businesses. Project founder Adam Smith said people "pay what they feel" for the goods by giving time, money or skills. The food is donated by several major supermarket chains as well as cafes, restaurants and food banks. How can you stop wasting food? Mr Smith said the idea of using food which was being thrown away began three years ago when a cafe, offering meals produced from waste food, opened in Armley. There are now more than 120 similar cafes across the world. 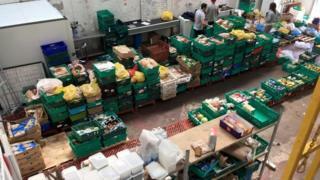 The Real Junk Food Project receives on average between two and 10 tonnes of food at its warehouse every day. "Usually we donate it [leftover food] to local schools but over the summer we ended up with all this surplus and we wondered how we would get rid of it," Mr Smith said. "We moved it to one part of the warehouse, put a notice up on social media asking people to come and get it, and it just went mad." He added: "We ask that you pay what you feel in time, money and skills. We do have people coming with the intention of paying and if it carries on like it does, it will pay for the cost of the warehouse." He said he hoped to open similar "supermarkets" in towns and cities across the UK.